The Asiatic lily’s eye-catching, star-shaped blooms have made it famous, and the pretty pink color of the Chianti variety really turns heads. Each stem boasts 3 to 5 blooms, so you can create very full, rounded bouquets, which look equally beautiful when made up entirely of lilies or when mixed with other flower types. Your lilies are picked at just the right moment, custom-packaged, and air-shipped that same day to arrive in all their glory direct from the grower, ensuring you flowers that are the most exquisite and longest lasting you’ll find anywhere. Special Meaning Anniversary Flowers: Each wedding anniversary has a designated flower. The Lily is the traditional 30th Anniversary flower. Prepare your flower containers by cleaning them with mild soap and a drop of bleach or by using disinfecting wipes. This will clean any residues and kill bacteria that might shorten the life of the lilies. Glass and plastic are the best materials to contain flowers. 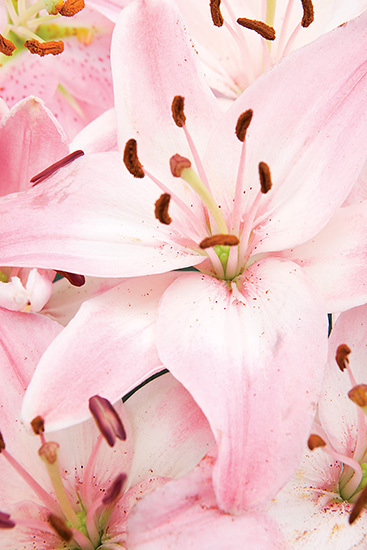 We do not recommend placing the lilies directly into containers that are metal, rusted, or made of clay or stone. These materials are porous and may contain harmful elements to your flowers. Fill containers with warm, room temperature water. Cold water is not readily absorbed and hot water can shock the flower. Remove all foliage that will fall below the water line. Allowing them to decompose in water will allow harmful bacteria to shorten the life of the flowers. We recommend cutting the lily stems underwater at an angle for best results. Flowers last longer when kept in deep water. Lilies will take up to 24 hours to hydrate. As the lilies open, you may gently pull off the pollen stamens to avoid pollen dust and to help the flowers last longer. Use a fork to lift stamens gently away from the lily. Be careful not to get lily pollen on your clothing or linens. Pollen sheds easily and stains whatever it touches (see helpful hints below). You may wish to place a protective mat under your bouquet to prevent pollen from falling on your furniture or carpet if you do not remove the stamens. HELPFUL HINTS: If the lily’s blossom is stained with pollen you can remove it by gently swabbing the petals with a Q-tip or pipe cleaner. If your clothes become stained with pollen DO NOT apply water. Remove the pollen with sticky tape or lay your clothing outside in direct sunlight until the stain disappears naturally. This may take hours but it does indeed work. Always add fresh water daily as these flowers can absorb a great deal of water. Change water at least every couple of days. Cloudy or discolored water can indicate decomposition and bacterial growth. The temperature in which you store your flowers is very important. Warmer temps will cause the flower to open quicker. Flowers last best in temperatures around 45 degrees. Do not store in the refrigerator. Lilies should be kept away from fruits and vegetables which produce ethylene gas which can compromise the flower’s vase life. Keep flowers out of direct light in a place with good air circulation. Cigarette smoking is harmful to flowers. Give the lilies adequate space to bloom as they need room to open up. They do not like crowding.